Rory McIlroy is the only player to have finished in the top 10 in each of the last four Masters, but another statistic may well give the world number two cause for concern. McIlroy needs a victory at Augusta National to join Gene Sarazen, Ben Hogan, Gary Player, Jack Nicklaus and Tiger Woods in having won all four major titles. However, next year will be his fourth attempt at completing the career grand slam and none of the five players to have done it needed more than three tries at winning the final leg. McIlroy admitted he had simply not played well enough to seriously challenge for a green jacket, despite battling back from being three over par after eight holes to card an opening 72. Subsequent scores of 73 and 71 meant a closing 69 left the four-time major winner six shots outside the play-off won by Sergio Garcia. "I feel like I've finished five or six back the last few years so give me a six-shot start and I'm your man," McIlroy joked. "I feel encouraged if nothing else. I feel comfortable on the golf course, like every time I tee up I've got a chance to win. "Top tens isn't what I'm looking for, but at the same time the ups and downs I've had here in the past don't quite seem to be so up and quite so down. It seems a little more steady and that can only bode well for the future." 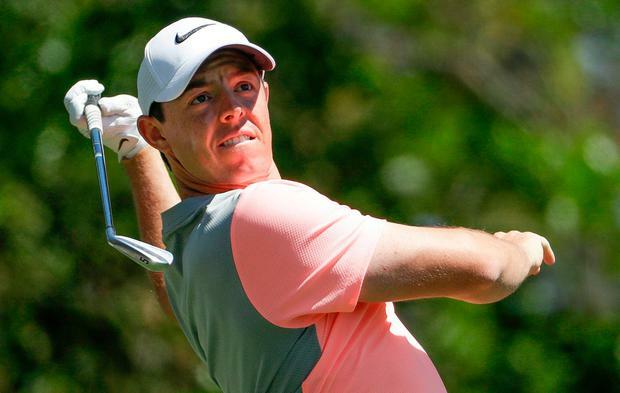 McIlroy has finished in the top seven of all four stroke play events of a 2017 campaign limited by a rib injury, but will make some major changes on and off the course before returning to action at the Players Championship. The 27-year-old plans to change his golf ball and experiment with more new equipment, while he is also due to marry fiancee Erica Stoll shortly. "I need to change my golf ball. That's a big thing," McIlroy added. "I thought my golf ball this week was doing weird things in the wind. It was very inconsistent so there's one thing I will change and try to work on the next few weeks. "I feel I'm swinging it as good as I have been for a long time, I've done a lot of good work with Michael (Bannon, his coach) over the last couple of weeks, my putting feels as good as it has done in a long time. "(US Open venue) Erin Hills is an unknown for everyone but Birkdale is one of the best Open courses on the roster and we are going to Quail Hollow for the PGA and I've had success there in the past, so nothing but positives ahead I feel and my game feels in good shape. "It's just a matter of working hard and putting myself in position to win. I've turned my focus to getting ready for the US Open in June and trying to add to my major tally there." Asked about getting married, McIlroy added: "I am excited. It's a great time in my life and it would have been nice to walk down the aisle in the green jacket!